When it comes to reaching an audience with intent to buy, it’s hard to pass up search engine marketing (SEM) as a primary digital advertising channel. AdWords, in particular, enables advertisers to leverage a variety of tools to engage consumers and businesses alike with compelling ads designed to drive action. With more than 1.2 trillion queries annually, Google’s search engine results pages are more dynamic, competitive, and useful than in previous years. As search engine results pages have evolved, so has the integration of search network ads within the results. As a platform, AdWords may be more complex than ever before, but these five simple techniques for getting the most out of your search network campaigns are as easy as it gets! In case you haven’t noticed, the U.S. population is face down most of the day, looking at their smartphones. Whether they’re reading reviews about a salon or looking for the nearest taco stand (or perhaps a Pokémon), Google is often at the core of their mobile search experience. According to comScore’s U.S. Desktop Search Engine Rankings, as of October 2015, there were 18.16 billion core searches on Google in the U.S., meaning that potentially half of those queries were on mobile devices. Knowing that mobile search has outpaced desktop, it’s a safe bet that mobile ad real estate is more valuable than ever before. AdWords makes it easy to engage the mobile audience as they search, by providing a “mobile bid adjustment” feature for all search network campaigns. This feature is incredibly useful because it gives advertisers the opportunity to bid more aggressively on mobile devices than desktop computers. During the Google Performance Summit in May 2016, Google announced that they were breaking up this bidding technology even further, which means that Base bids can now apply to mobile with bid modifiers set for desktop and/or tablet. 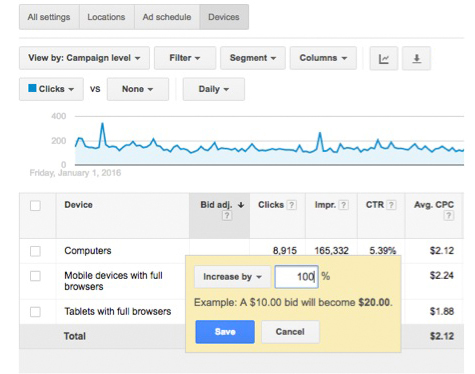 So how do you take advantage of mobile bid modifiers? It’s easy. Within the targeting settings of your campaign, navigate to Devices. This will take you to a table where the performance data is broken out between computers, mobile devices, and tablets. Click on the “—” adjacent to the “mobile devices with full browsers” row and select your bid modifier. It’s a good idea to adjust your mobile bid to at least +100%, but there’s no standard. Typically, bids on mobile devices are cheaper than bids on desktop computers (but that depends heavily on the vertical). It’s important to factor in why people are using their phones for mobile search and to consider how your ad within a mobile search result can be as practical as possible. If you’re a local business and are more likely to convert on a smartphone, it’s likely a wise investment to amp up the mobile bid modifier as much as necessary to engage the target audience. 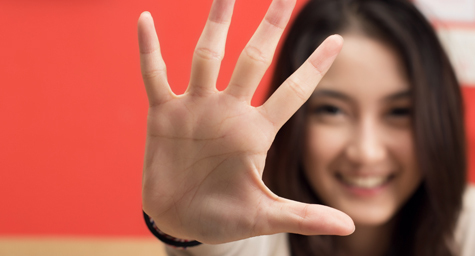 There’s no extra charge for ad extensions, but most people don’t take the time to use them. Ad extensions are a fundamental part of building a high-performance search network campaign, but they do require a bit of extra diligence to leverage them effectively. Google provides a variety of ad extensions to advertisers, which were developed based on extensive research regarding “utility” in the search results. In addition to being practical for the user, they provide navigational access to aspects of the domain that can be used to find a specific type of yacht. Google provides data regarding clicks on sitelinks so advertisers can tell which provide the strongest user benefit (an important clue in identifying what users find valuable). It’s a great idea to swap out sitelinks on a regular basis to gauge what consumers do and don’t find valuable. Sitelinks are also a great way to promote sale pages during special promotions and events. As a complement to sitelink extensions, callouts provide an opportunity for an advertiser to include compelling value proposition statements in the body of the ad. While they’re not clickable, callout extensions provide an extra opportunity to highlight features, benefits, or incentives that can help earn a click. Using callouts also increases the size of the ad, which allows it to occupy more space within coveted ad real estate. Call extensions, often hailed as the most important extension for service-based businesses, are the most prolific feature that AdWords provides. Call extensions empower advertisers with an opportunity to receive a phone call directly from the mobile search result. This is incredibly useful for “on demand” service-based businesses such as plumbers, electricians, lawyers, and dentists. Call extensions are also easy to track, as Google provides a forwarding number directly in the search result, which is attributed in its own conversion column within the management dashboard. 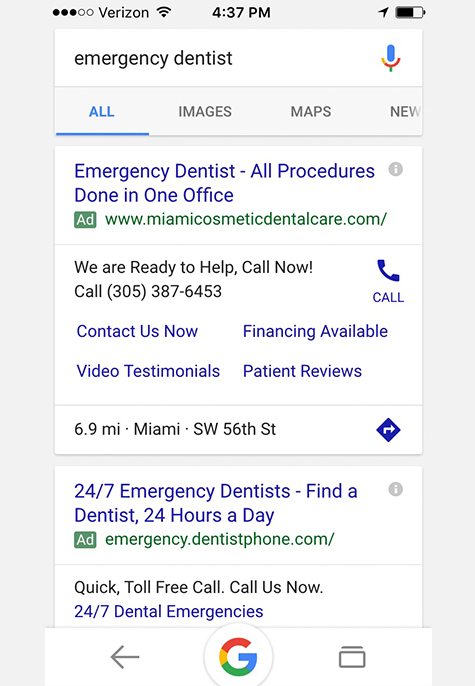 Review extensions enable advertisers with a sizable collection of reviews on their Google My Business listing to include their rating in the ad itself. Considering that 88% of consumers trust online reviews as much as personal recommendations, the opportunity to improve the “trustworthiness” of a search network ad should not be neglected. In the mobile-empowered world, apps are prolific and becoming a staple of “on the go” engagement with consumer brands, large and small. 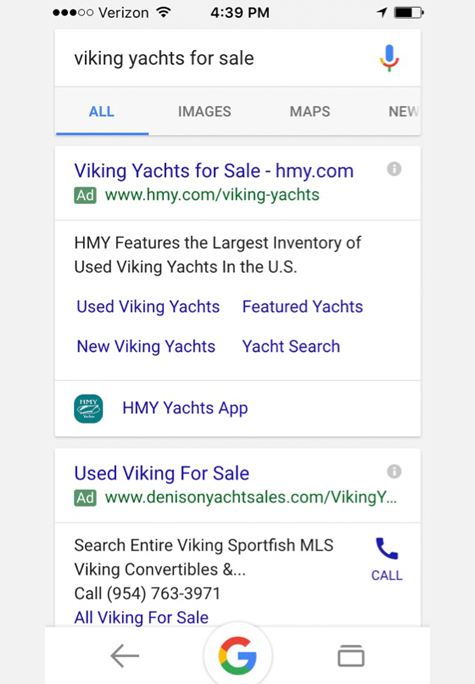 Google’s latest ad extension provides mobile search users with an opportunity to download a company’s app directly from an AdWords ad. This is incredibly easy to configure, as long as your app is available in the Android and iOS marketplaces. 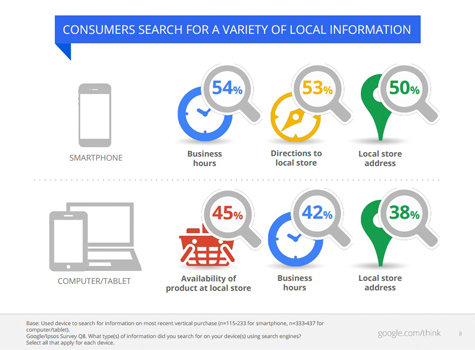 Location extensions are a critical source of navigation for consumers looking to find small businesses. 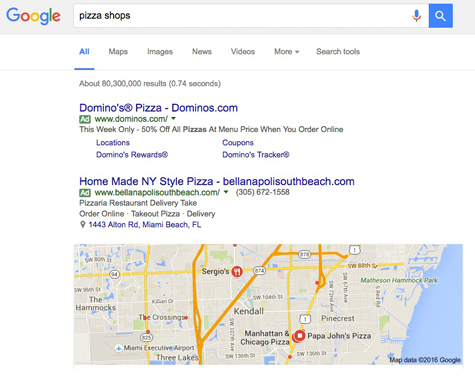 Location extensions, similar to the review extensions, are enabled by a Google My Business account. In many instances, mobile search users will click a location extension while driving or walking to a physical location. Clicks on location extensions don’t cost any more than a regular click on the search network ad, but almost guarantee that a user is interested in physically visiting the location itself. This is an invaluable asset for local businesses, and considering that 1/3 of all mobile searches have local intent, it’s a best-practice to employ location extensions as a fundamental part of a search network advertising campaign. Even if an advertiser doesn’t want to invest in remarketing (which is a poor decision), the Google Remarketing Tag should still be installed. Having the tag in place means that audience statistics and profile data can be collected. Google provides invaluable intelligence about who is visiting your website through their Audience Insights reports, which are fed data collected by the remarketing tag. Audience Insights reports provide advertisers with an incredibly accurate profile of who’s visiting their website and what the target audience’s interests really are. 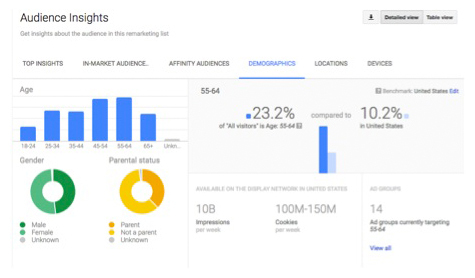 Demographic data and “interest” data is invaluable when determining where to place display ads, and how to serve them. The good news is that there’s no need to pay for this information. Simply install the remarketing tag across all pages of the website, wait a few weeks and, like magic, you’ll have profound user insights to help guide marketing decisions. To take this tactic once step further, create audience segments within the website to understand unique audience profiles based on the hierarchy of the domain. In the same study, Google found that consumers have a clear preference when it comes to having ads customized to their surroundings. They found that 67% of smartphone users want ads customized via city and ZIP code, and 61% want ads customized to their immediate surroundings. They also found that 61% use the address or phone number in the ad and 68% use the “Get Directions” or “Call” buttons. To simplify and reiterate the lesson in this data, when targeting ads for local consumers, be sure to target ads by location and to use location extensions. AdWords makes geo-targeting and setting up location extensions easy. As an advanced tactic when exploring “user location” reports, if it becomes apparent that a significant concentration of conversions takes place in a specific geography, increase your geographic bid in that area. This allows advertisers to bid higher in regions where they stand a better chance of earning conversion, while still maintaining ad coverage in a larger area. Modified broad match keywords are one of the most important aspects of search engine marketing through AdWords, but can be tricky to leverage effectively. While they present an incredible opportunity to maximize reach, mine keyword data from search details reports, and generate new business, they can zap budgets very quickly if they’re not tempered with negative keywords. When employing modified broad match terms within an ad group, be sure to leverage a negative keyword list and explore the search term detail reports on a regular basis. In many instances, modified broad match keywords can help to increase impression share while focusing the core relevancy of the keywords that trigger ads in the first place. It doesn’t take much extra effort to utilize a modified broad match keyword, but it’s not an available feature when selecting match type from the dropdown menus in the keywords tab. In most instances, an advertiser will need to add the “+” parameter to the beginning of each word. This requires that one or more of the keywords selected appear in a query when triggering an ad. Broad match—without the modifier parameter—can include “similar” phrases, which are often completely irrelevant. If the goal is to discover new keyword targeting possibilities, maximize exposure in a short period of time, or cover an entire spectrum of language without sacrificing too much relevancy, then modified broad match terms are the way to go. It’s worth converting a few high-performance phrase match terms to modified broad match as a test, in order to gauge impact on conversion over time. Optimizing search network advertising campaigns for maximum performance is a process that takes time. Conversion tracking, of course, is at the core of this process and should be factored when evaluating whether ad optimizations are effective at reaching specific goals. During the recent Google Performance Summit in May 2016, Google introduced new ad technology, such as Promoted Pins, and alerted the SEM community that big changes are in store for AdWords in the coming months (including an entirely redesigned management interface). With so much change on the horizon, it’s important to maintain a high level of flexibility in optimizing search network campaigns. Don’t be afraid to experiment, but proceed cautiously so as not to obfuscate the ability to gauge impact. Remember, what can be measured can be improved! Keep up with the latest trends in search engine marketing. Contact MDG Advertising today at 561-338-7797 or visit mdgadvertising.com.